Leavenworth (Wash.) Golf Course is hosting the 18th Washington State Women's Best-Ball Championship, conducted by the Washington State Golf Association (WSGA). As of March 1 you can begin posting scores from rounds played within the boundaries of the Washington State Golf Association. The WSGA is a seasonal golf association which has a period of time (November 15 to the last day of February) in which scores played from within its boundaries are not acceptable for handicap computational purposes. Scores made when a Local Rule for Preferred Lies (Winter Rules) is in effect must be posted for handicap purposes unless the Committee (preferably the Handicap Committee in consultation with the Committee in charge of the course) determines that course conditions are so poor that such scores are not acceptable and should not be posted. Scores made during temporary situations are acceptable for handicap purposes when the conditions of the course are equivalent to the USGA Course and Slope Rating. The USGA will present its highest honor, the Bob Jones Award, to longtime Oakmont (Pa.) Country Club professional Bob Ford in a ceremony on June 13, 2017, during the week of the 117th U.S. Open Championship at Erin Hills in Erin, Wis.
Don Scott passed away on December 17, 2016, from complications of a severe car accident suffered in September. He was 69. The United States Golf Association will host the 2017 North American Golf Innovation Symposium on March 6-7 in Vancouver, B.C. Tags: Slideshow, USGA, Vancouver B.C. Erik Hanson of Kirkland, Wash. and Ben Garrett of Seattle shot a team score of 7-under par 63 in earning medalist honors in qualifying for the 2017 U.S. Amateur Four-Ball; while Ellie Slama of Salem, Ore. and Amanda Minni of British Columbia teamed to win the qualifier and advance to the U.S.
Reid Hatley of Hayden Lake, Idaho shot rounds of 64-68 to win the 7th Washington State Men's Mid-Amateur Championship, held at Gamble Sands in Brewster, Wash. The 7th Washington State Men's Mid-Amateur Championship is being held August 23-24 at Gamble Sands in Brewster, Wash. 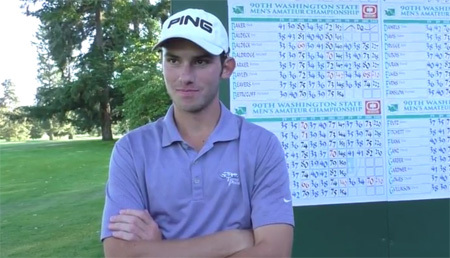 Celebrating its 50th installment at the Seattle Golf Club, the Pacific Coast Amateur crowned a new champion in Will Zalatoris of Plano, Tex.